In Which the Margaret B Steamer is Blown Up on Lake Wesserunsett. . .
Here’s a bit of Lakewood Theatre history you may not have heard about. . .
As many of my readers know, Lakewood Theatre began as a rather ramshackle “trolley park” on the Skowhegan-Lakewood-Madison trolley line. As part of the Somerset Traction Company’s complement of services, the Margaret B had been ferrying passengers around Lake Wesserunsett for several years. 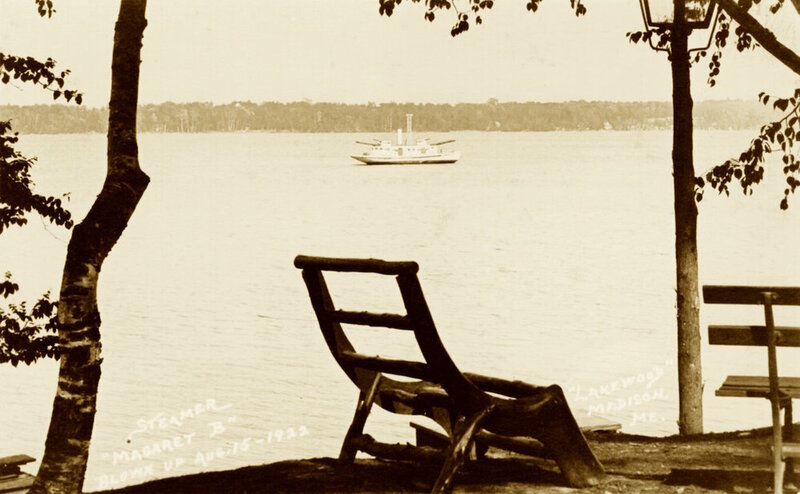 In addition to picking up cottagers around the lake on show nights to bring them to the Lakewood Theatre, she also ferried them across the lake so that East Madison residents could take the trolley from Lakewood to Skowhegan or Madison. In the late 1910s, Margaret B began getting a little clunky, and had been taken out of commission. In 1922, the Somerset Traction Company decided to dispose of the old girl, and figured they could capitalize on the process! They tricked her out as a "battleship" and stationed her in the middle of the lake. A “grand water spectacle” was promoted, and visitors to the play that evening were charged an extra 25 cents to marvel at the elaborate exhibition. On the evening of August 15, 1922, after the regular play, several motorboats (dressed up to represent "torpedo boats") "opened fire" on the Margaret B. Fireworks were thrown from the "torpedo boats" and from the pier onto the Margaret B, which then burst into flames and burned for several hours in the water. Look closely and you can see the old steamer Margaret B tricked out as a "battleship" -- including fake guns on either end! According to an article in the local paper, nearly 3000 people were present. For a mere quarter, it sounds as though they got their money’s worth. . .
Do you have stories, postcards, or pictures of Lakewood? Contact me! I'd love to use them for my upcoming book. . .